For over 20 years, Edwards Electric & Telecom, Inc. has provided a wide array of electrical services to clients spanning the East Coast. What began as a small business operating out of a 2-car garage, has grown to a 7,500 square foot shop and office space, 25 full time employees, and a fleet of about 15 company vehicles. We serve customers within a 300-mile radius of Lancaster County, Pennsylvania. We are licensed in Pennsylvania, Delaware, New Jersey, Maryland and Virginia. Our staff are equipped to meet our client’s needs, no matter the time or location. 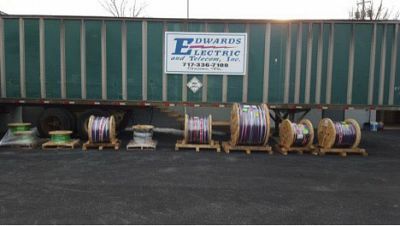 In an effort to provide optimal service to our clients, Edwards Electric & Telecom, Inc. focuses our energy on commercial and industrial projects. On the industrial side, we design and build industrial systems, service and troubleshooting equipment. On the commercial end, we offer design/build service to commercial clients. We can also provide the design, building, and installation of security systems, voice/data, fire alarms, building automation, and more. Click here to see a list of our recent industrial and commercial projects.